I knoooowwww, I'm slow and not able to keep my promise about 'Swinging Henry' (though ... I've told you that I will post the rest of it till sunday, but I didn't tell you what sunday it will be ;) ). I think (hope) that at least some of you will miss 'Samantha' - so here is the next part of this at least. "I know, it's not easy, Zeke. But it is the right decision. An open adoption can be a good solution for every involved person." Zeke finally stopped staring out of the window and turned round to Mr. Connor. "It offers you a lot of possibilities. And I will be there to make sure that her adoptive parents will know about your history. 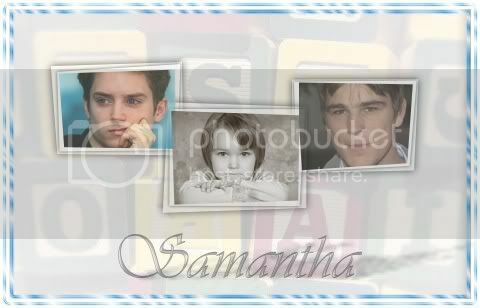 They need to understand how important it is for Samantha that you remain a part of her life. An adoption like this doesn't mean that you will never see her again." He knew he should be grateful for this option. He would be able to see her growing up, he could visit her. Maybe she could even spend a weekend together with Casey and him now and then. This was much more than he had expected. But all he could think about in the moment was: She will call another guy 'Daddy'. It was not that she called him like that. She called him 'Zeke' and this was okay ... had been okay ... But now it just hurt. Zeke sighed and forced himself to let go of these thoughts. Better to remind all the positive aspects. "Yeah, thanks, for everything. For letting her stay over summer ... and all. Hope, Mrs. C. will be okay with that too." "Oh, she would bite my head off when I let it happen that she ends in a children's home," Mr. Connor assured him. "You are welcome too, Zeke. Come and stay as long as you want. It would be nice to have you and Casey around for a while." Casey again! He didn't like to think about him in the moment. "I'm afraid Casey will be very disappointed about my decision." "But he will have to accept it." "I know he can be a little dickhead ... and he's used to get what he wants. Art School. His way of life. If I'd had my way he would be a prospective jurist now. But it's not the time to make a drama, this is not about him but only about Samantha. If you don't feel ready for all the responsibility ... and no one can blame you for that ... you do what is best for her." "Your decision would be different, right? If she would be your daughter, you wouldn't give her away." Mr. Connor hesitated only for a moment. "No, probably not," he admitted. "But I'm not like you. Our history is different. Meredith and me, we were young when she got pregnent. But I already had graduated, I had a prospect of a secure job. We were married. And it never was a question that we wanted a big family, at least three children." This distracted Zeke from his gloomy thoughts. "What did change your mind? Why don't Casey have a handful of brothers and sisters?" Then he realized that this might be a bit too curious. "Sorry, non of my business, I guess." "No, it's okay. Sometimes things take a different route than planned. Meredith ended up having complications of labor and delivery. One week later the doctor told us that we would risk her life with another childbearing." He sighed slightly at this memories. "It was hard to accept first, especially for Casey's mom. But we can't complain, he makes up for all. He's a good son." In this moment Zeke started to understand better. Why they loved Casey so much. Why they sometimes got a bit too overprotective. Why it had been like a shock for them to find out that Casey would never marry, because he preferred to share his life with another guy, with him, Zeke. They would never get the chance to love and spoil at least a lot of grandchildren. "Casey was always someone special. Other boys love to go to summer camps, fishing, bonefire. Sports. Young guys usually are crazy about football or baseball. All what Casey wanted was to go to his grandma's farm. For hours they could cower somewhere in the garden to observe a racoon or a squirrel. One day she gave him the old camera of his grandpa and he had found his obsession. I admit, I was not overly happy with all that. I could see other kids tauting him and later, at highschool ... sometimes I was so disappointed, even angry at him. Probably it's time to apologize." "Oh, he knows that you would never hurt him on purpose. You are a great dad." "Am I? All I wanted was to see him happy. Thought a job in a law office would be good for him. It's a secure job, interesting, with the prospect of a partnership later. I was even thinking about an own office. Connor & Son." "Just ... this is my life, not what Casey wants. I needed much too long to realize this. It was you, who removed the scales from my eyes, Zeke. The way you handle all this with Samantha is much more mature than I was. You are a great young man, Zeke, and I'm sure, you will make your way." Great chapter. I enjoyed learning some of Casey's history, though I wasn't happy with Zeke's decision. :( But who knows... he still has time to change his mind! I enjoyed to write this chapter because it brings Zeke and mr. Connor closer together. Zeke can need every help he can get now. Difficult times for him. The next chapter is finally online - sorry for the delay. Yes, hard times for our Zeke, but at least he has people by his side he will support him. I enjoyed this chapter but can't help thinking that young men are far different from young women. Women are expected to keep and raise their children, why should Zeke feel any different? I'm sorry but I think he's being too selfish. The Connor's may get their grandchildren via Sam in any case. Yes, you're right, if Zeke would be a young mother most people wouldn't understand how he can give away his daughter. But I wouldn't call him selfish, he's still so unsure about this new situation and he has never had a real family. Hard times for him ... but maybe it's not too late yet to change his mind. Mr. C. often thinks like a lawyer and he still have some doubts against Zeke ... but it is more because he cares for Casey ... and for Samantha. He did notice how much Zeke is struggling with the wish to make the right decisions and it it good that he finally opens up a bit against him. It will make it easier for both of them to understand the other.